"I’m Sheryl...Weddings excite me! I arrive with my brides in the morning ready to have a blinding day! I am a bubbly person with a quick laugh and a natural ability to make people feel at ease, and with that, comes effortless magical images. I love to watch how my couples interact with each other and I then shoot their wedding accordingly. So that being said, no two weddings will ever look the same. The longer I have been in this industry, the more I have come to realise that ‘like goes to like’. I am a tattooed wife of a rock guitarist and daughter of a rock drummer and extremely proud to be known as passionate soul that take life with both hands and shakes it hard with grit and determination!" Lavender’s Blue Floristry is the creation of Amy Barnes; founded from a kitchen table many moons ago, the business opened it’s shop doors in 2010 and has blossomed since! With the help of a small team, which includes her long suffering Mum, Amy has created stunning floral arrangements for hundreds of events in Gloucestershire and Herefordshire; from weddings to funerals. The Lavender’s Blue team also share their knowledge and enthusiasm for floral design at workshops and presentations throughout the year. 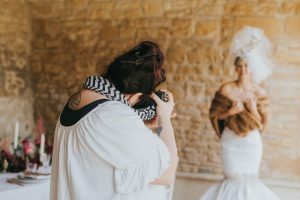 "In the last 5 years I’ve honed my skills in juggling a camera and drink on the dancefloor so I get the action shots you want to remember your wedding by. I’ve also completed an MA in Documentary Photography which means I’m really good at shooting in the right place at the right time. I spend a lot of time on the road but I live in Bristol – a city which fuels my obsession with art galleries and exhibitions"